Given the success of the first EOLE event and the growing interest attached to FOSS law issues, a new seminar is organized this year. It will take place in Brussels, capital of Europe, in the prestigious confines of the European Parliament. Once again, it will involve many specialists. The themes of the day will be "FOSS Terminology" and "Mutual software development and other experiences". A Committee gathering ten leading experts in the field will supervise the scientific aspects of the programme. The Greens / European Free Alliance actively supports this event, jointly with many other industrial, university and community sponsors and supporters. Reduced cost is not the sole reason of open source’s success: independence, flexibility and innovation are key arguments as well. Nowadays, free and open source software represents a serious and competitive alternative to “traditional proprietary” computing, and is actually one of the major current technological trends: open source components are now at the heart of critical applications, services and strategic products. However, trust in software is not just a matter of code, but involves also legal reliability. Within the framework of durable business models, Software has to be available and useable, not only technically, but also legally speaking. Carrying out in-depth thinking and analyses about free, libre and open source software (FLOSS) licences has therefore become unavoidable. FLOSS licences, far from being opposed to the copyright system, only exist as long as they are based on this system, and should be seen as manifestations of its flexibility rather than of its obsolescence. For instance, without copyright, no one could impose the obligation of redistributing software under a free licence. Moreover, anyone could pretend to be the author of software that he has actually not developed or distribute it without providing the sources, which is absolutely banned by the free and open source movement. 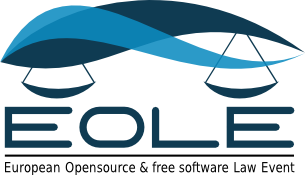 As open source is also a matter of law, and given that it relies on an original and innovative use of copyright, what EOLE proposes is to foster the understanding of the legal aspects of the FLOSS movement. Indeed, the EOLE project departed from the observation that, despite the importance of FLOSS development, and despite the fact it relied on a subversive use of intellectual property, information on the legal aspects of this peculiar licensing scheme was lacking or imprecise, especially in Europe. EOLE was therefore created in order to foster the dissemination of qualitative knowledge pertaining to FLOSS licensing, as well as to pool, share and promote, on a neutral and non-partisan basis, the development of good legal practices in the field.